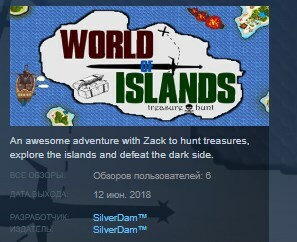 World of Islands - Treasure Hunt is a Choice Maker RPG Game. You can choose to be a friend or an enemy, the game is short and might take 5 to 7 hours to complete. It's all about Zack trying to hunt treasures and fight for it, also trying to stay as much as possible with the good guys and not to cause any damage to them. Deciding to fight the Dark Lord is a great adventure, and the player has to face the army of the Empire if he joins the Dark Lord. So many loots hidden in the Open-World map waiting for you to find it. No waypoints available, feel free to go everywhere and make your own story.